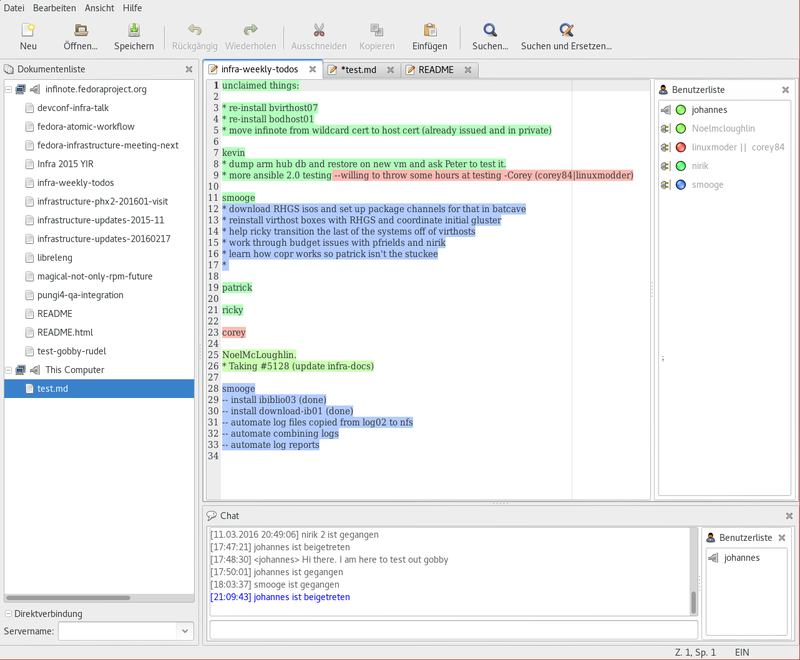 Gobby is a collaborative editor supporting multiple documents in one session and a multi-user chat. It is developed in GitHub, and instructions to download and getting started as well as other documentation is available on the Wiki. On this page, a rough overview of where the most commonly accessed resources of Gobby are is given, along with news concerning the project. Bugs and feature requests in Gobby should be reported in the github issue tracker. This wiki page lists how you can obtain Gobby for your computer. The source code can be obtained directly from GitHub. Be sure to read the Development wiki page to learn how the code of the project is structured. libinfinity 0.6.8 and libinfinity 0.7.1 have been released. 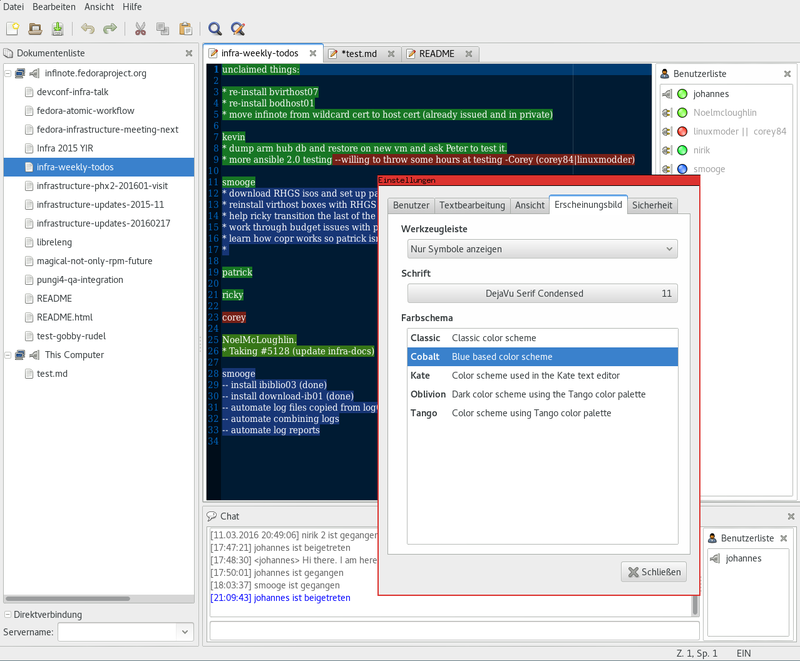 These are bug-fix releases in their respective stable series, fixing a possible crash in the infinote server infinoted when uploading a document. libinfinity 0.6.8 and 0.7.1 can be downloaded from the Wiki page on GitHub. libinfinity 0.7.0 has been released. The primary new feature is support for gobject-introspection, which allows using the libinfinity API from higher-level programming languages such as Python. Furthermore, situations were a disconnect happens silently are now recognized much faster due to usage of TCP keepalive probes. Also, the infinoted server allows to listen on only a specific network interface. Support for GTK+ 2.x has been dropped, GTK+ 3.x is the only supported GTK+ version now. There is no version of Gobby yet which makes use of libinfinity 0.7.0, however the standalone server, infinoted 0.7.0, can be operated with the current release of Gobby, Gobby 0.5.0.
libinfinity 0.7.0 can be downloaded from the Wiki page on GitHub. libinfinity 0.6.7 has been released. This is a bugfix release in the 0.6.x series. Primarily, it fixes a problem where the library would cause a crash when linked against glib 2.46 or newer. It also fixes potential crashes in some other uncommon situations. It is recommended to update to this new version of libinfinity, especially if you plan to upgrade glib to 2.46 anytime soon. libinfinity 0.6.7 can be downloaded from the Wiki page on GitHub. This release and all future releases will be signed with a new, stronger GPG key with ID 0xBF1D92C7. libinfinity 0.6.6 has been released. This is a bugfix release in the 0.6.x series. It fixes a problem where a server’s certificate would silently be accepted even though it failed verification if no certificate pinning is performed, i.e. the hostname matches and its CA is trusted. A potential client-side crash is also fixed which occured when a server is shut down while still being connected. It is recommended that all users update to this new version of libinfinity. libinfinity 0.6.6 can be downloaded from the Wiki page on GitHub. libinfinity 0.6.5 has been released. This is a bugfix release in the 0.6.x series. It fixes an error message in the server log stating the reason a client certificate was rejected, and several potential crashes where data would be sent to already closed connections. Libinfinity 0.6.5 also builds cleanly on FreeBSD now. libinfinity 0.6.5 can be downloaded from the Wiki page on GitHub. libinfinity 0.6.4 has been released. This is a bugfix release in the 0.6.x series. It solely fixes build issues on Mac OS X. If you are not using libinfinity on OS X, there is no need to update to libinfinity 0.6.4.
libinfinity 0.6.4 can be downloaded from the Wiki page on GitHub. libinfinity 0.6.3 has been released, a bugfix release in the 0.6.x series. It fixes the certificate dialog being shown even when the certificate has already been accepted previously, a possible timing attack against the server password and it allows to configure the directory-sync plugin such that non-owners can read the created directories as well. libinfinity 0.6.3 can be downloaded from the Wiki page on GitHub. Gobby 0.5.0 has been released today, together with libinfinity 0.6.1. These packages represent new major versions of Gobby, and puts the experimental 0.4.9x series on a more stable footing. Significant new features include a built-in server in Gobby so that it is no longer necessary to run a dedicated server to connect to another computer running Gobby, and a permission system to grant and revoke permissions from different users. Gobby 0.5.0 is fully compatible to Gobby 0.4.94. Gobby 0.5.0 can be downloaded from the Wiki page on GitHub. We migrated the website, the repositories and the bug tracker to Github. If you reported a bug in the past, we humbly request you to report it anew on Github. Thanks.